The beer company Busch has decided to poke some fun at the coffee shop chain Starbucks by changing its name. Fall hasn't started yet but Starbucks has already unleashed its hit flavor Pumpkin Spice Latte. Now, Busch has decided to follow suit with its own satirical take on the coffee chain's holiday flavor but instead of making its own pumpkin flavored beer, the beer company has changed the name of it's Busch Light beer to Busch "Latte". 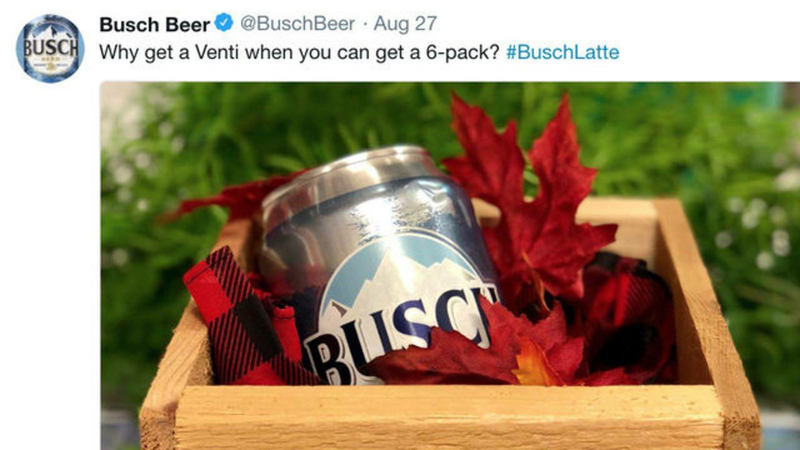 Busch has released a teaser of sorts on Twitter over the last couple days showing a Busch can wrapped in a scarf and fall leaves. The captions read, "We call our baristas, "bartenders"" and " Why get a Venti when you can get a 6-pack?" The announcement came Tuesday that Busch Latte is finally here but the flavor of the beer won't reflect its name change. Unlimited free sh*t all over the free bathrooms, free coffee for the dindu's!